Ansel Elgort Shows Off His Amazing Singing Voice – Watch Now! 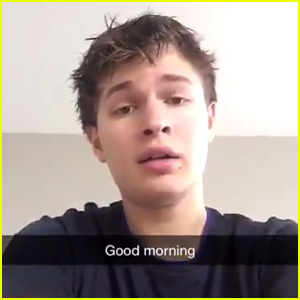 Ansel Elgort sent fans’ hearts aflutter when he showed off his singing voice in a Snapchat video on Tuesday morning (February 23). The 21-year-old Insurgent actor posted the video of himself singing John Legend’s song “Good Morning” on Twitter. How Did Rihanna's ANTI Go Platinum Already If It's Available For Free?! Kanye West Is Reportedly No Longer Executive Producing Rihanna's Much-Anticipated Album ANTI! Amy Schumer Earned THREE Writers Guild Nominations — Check Out The Full List Of Nominees HERE! Liam Payne’s New Massive Tattoo — A Symbol Of His Love For Cheryl Fernandez-Versini?